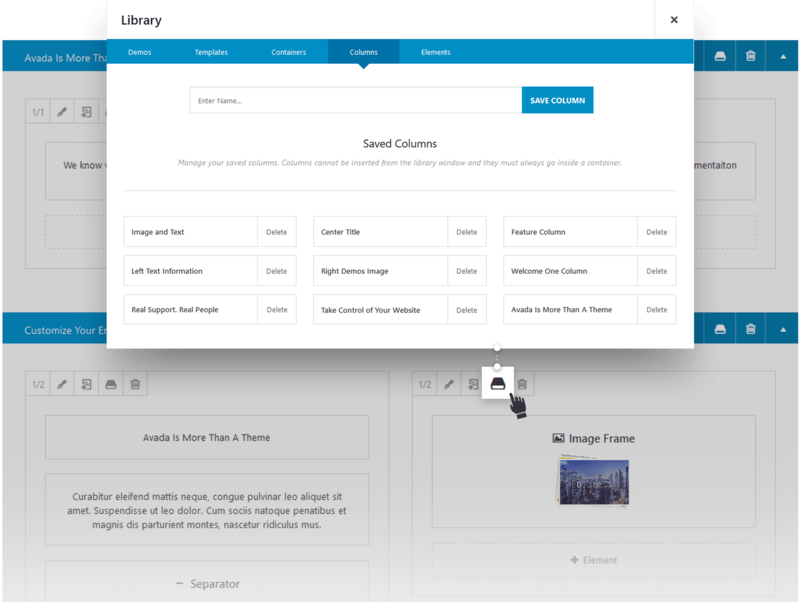 Visually drag and drop content to create beautiful pages. Easily and accurately drag and drop page content to your desired location with incredible speed and performance, making the page building process easier and faster. Fusion Builder Elements are so versatile and are loaded with options. They allow you to quickly build professional websites that will set you apart from the competition. Not only can you set global theme options as defaults for each element, Fusion Builder allows you to override anythese settings inside the element for maximum flexibility. Nested columns are here along with an intuitive interface to easily manage them. The design possibilities that nested columns open up are extremely powerful and can easily transform your website. You can now harness the power of your right click, allowing you full control over editing your pages containers, columns and elements, without tracking the mouse or searching for your desired function. Functions include; Edit, Clone, Save, Delete, Copy, Paste Before, and Paste After. The Library is a hub for all your content and is always accessible. It stores all of your custom saved content like containers, columns, elements and even full pages allowing you access to them anywhere on the page. We have added further functionality to your Fusion Builder Library by giving you the ability to edit individual library items (elements, containers, columns and globals) outside of the page builder. Don’t need your library item to be a global one any more? Simply click the global icon in your page builder. In addition to our awesomely powerful Fusion Builder Library, we give you the power to create Global assets. These assets once created can be placed anywhere on your website in multiple locations, and the best thing is, to update them all, you only need to edit one and the changes will spread sitewide. Click the save icon on your desired item, give it a name, then check the “Save As Global” check box. Modify the global item anywhere it’s located and save the page. All instances of the global item will auto update. Find your global item in your Fusion Library and insert it into any page or post, then save the page. Fusion Builder gives you the ability to import any single Avada demo page from our fully featured professional demos. No Coding Knowledge? No problem! Fusion Builder comes packed with features, tools and options to empower you when building your website. What’s more, is there is no coding knowledge required. Fusion Builder comes with over 50 amazing design and functionality Elements that really give your website room to breathe, flex and grow. What’s more is, each element can be customized to suit your needs. Columns and elements all have animation settings, want your text to slide? No problem. Building your site the way you want to, with no coding knowledge required at all is incredibly intuitive with our super easy to use visual drag and drop builder interface. Store the favourite parts of your design to use again and again wherever you like. Edit your library components once and the changes will reflect across your entire website automatically. You can now utilize custom CSS on a per page basis to really make your websites design flourish. Thanks to the Fusion Builder Library, you can now import single pages from your favourite demos and customize them as you like. Import and Export your Theme Options and website content to use again on another website with Avada or share with others. Search within Fusion Builder to find your favourite elements and components super fast. Travel back in time and undo the edits you make to your website in real time. To help save you time and effort we have pre-built a whole host of column combinations to give your website layouts a super boost. Nested Columns allow you to place column combinations inside existing columns to give your design even more flexibility. Each and every single Fusion Builder Element allows you the power to customize its appearance and functionality to over-ride Theme defaults. Organise your website for quick access and ease of use with Fusion Builder by renaming your page containers. If there’s a registered post type enabled on your website, Fusion Builder is compatible with it. From Woocommerce pages to blog entries and even Portfolio pages, Fusion Builder has you covered. The main Fusion Builder Control Bar never leaves your sight. Access your Custom CSS, Library and History States. Wherever you go, the control bar goes with you. Fusion Builders Welcome Screen gives you a full guided tour as well as support access, add-ons and somewhere to change Fusion Builder Settings. Only see what you’re working on, and hide everything else on your page with Collapsable Containers. Select which Elements you want to use throughout your website, turn them on and off in your Fusion Builder settings. Our Fusion Builder Developer API gives anyone with the know-how full access to extend Fusion Builder as they wish. Your Avada Theme Options work in tandem with Fusion Builder by giving you access to your default settings and Elements allowing you the ability to inherit directly from there, or over-ride on the fly. Fusion Builder allows you to save any type of custom content and reuse it over and over, and share with others via export. is to treat you as we would like to be treated. The possibilities are endless and the most exciting part is yet to come … both design and code is already being created to produce the best front end editing experience the market has ever seen in a page builder.